2:01 p.m. - 6:59 p.m.
Ralphie Aversa is a quadruple threat. His platforms on television, radio, print, and the Internet allow him to tell compelling stories in a variety of fashions to a vast audience. His forte is interviews â from topic experts to national newsmakers. Ralphie has spoken with everyone from Lady Gaga to Matt Damon. Heâs covered a wide variety of events on location, including parts of the 2008 Presidential Election and The GRAMMYs. In 2013, Aversa reported live on location from every major music awards show. âRalphie Tonightâ offers exclusive interviews, hit music, soon-to-be hit music, and candid commentary on the stories of the day. 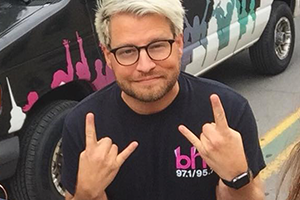 Ralphie is also very active on Facebook, Twitter, and Instagram â managing his own accounts and commonly interacting with listeners. In addition to his own platforms, Aversa has contributed to Yahoo! News, Music Choice, WPIX TV (New York), FOX, CNN, HLN, MSNBC, TMZ, Life & Style Weekly, and MTV News. Aversa attended Syracuse University, dual-majoring in broadcast journalism and marketing. He hails from Niagara Falls, NY.